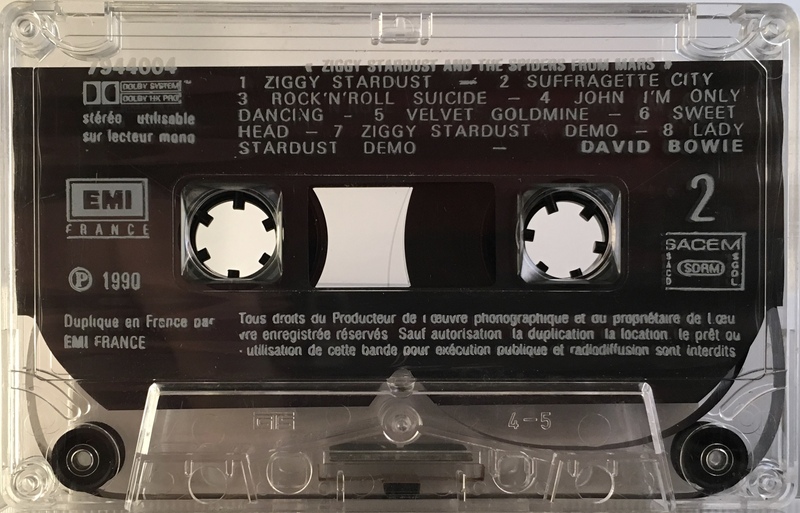 The Rise And Fall Of Ziggy Stardust And The Spiders From Mars: EU; EMI; 264-794400-4; 1990. 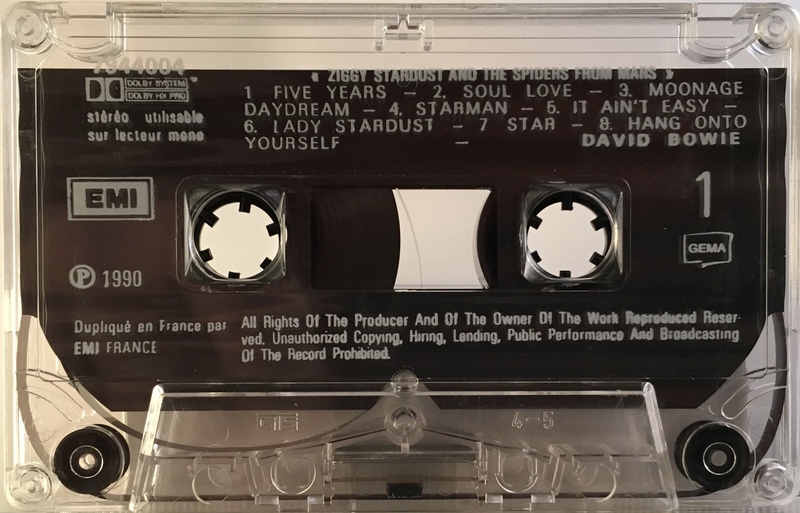 Although made in France, the cassette is intended for Europe wide distribution. Titles in English; information in English on side 1 and French on side 2. The mechanical rights are credited to GEMA (Germany) on side 1 and SACEM (France) on side 2. The cover is printed in Rouen, France. 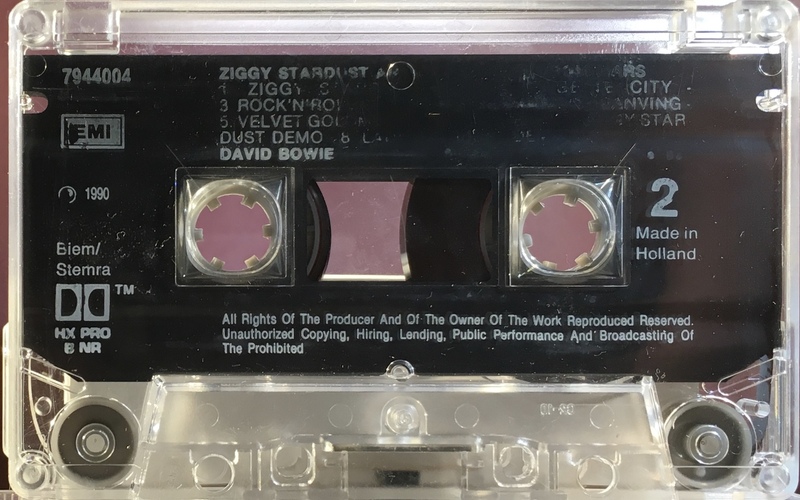 The track sequence has been slightly adjusted from the LP format so that tracks 1, 2 and 3 from side 2 ‘Lady Stardust’ and ‘Star’ and ‘Hang Onto Yourself’ have been added as the last tracks on side 1 to give room for the bonus tracks: ‘John I’m Only Dancing’, ‘Velvet Goldmine’, ‘Sweet Head’, ‘Ziggy Stardust (original demo)’ and ‘Lady Stardust (original demo)’ to be added to side 2. 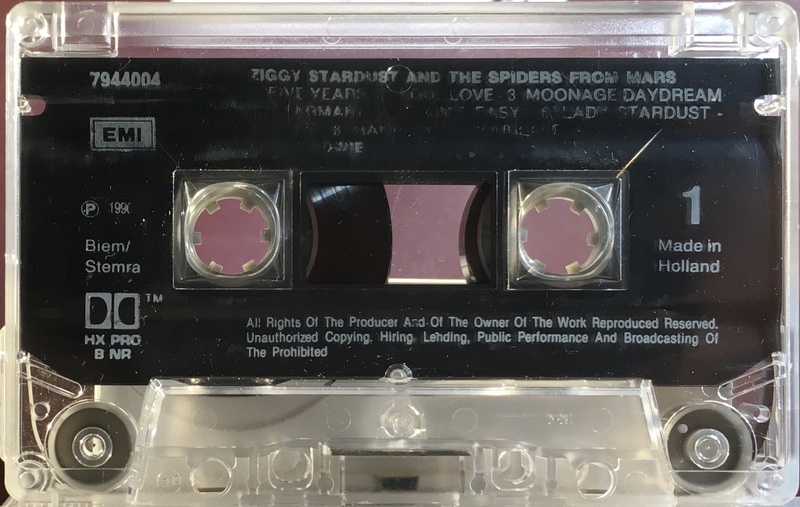 Although made in Holland it comes in the same French made EU release as above (264 prefix on catalogue number), the cassette is intended for Europe wide distribution. Titles in English; information in English. The mechanical rights are credited to BIEM/ STEMRA.